Drama Queen has been learning taekwondo since the beginning of the year at her high school. She is now doing yellow belt. Her lessons are held once a week on Saturday mornings and she loves taekwondo. But I am not too happy with the coach. I think he lacks integrity and is not forthcoming with me at all. When I first signed up DQ for taekwondo, I called the coach to inquire about the class. He did not reveal to me that the class will be held in a school in Puchong at least once (sometimes twice) a month. And he did not inform me that all the grading will be done in the Puchong school too. The distance from our house to where the Puchong school is located is about 40 km, both ways. When the coach kept informing DQ that classes will be held in Puchong, the hubs and I got terribly pissed. It would take us 3 hours to bring DQ to the school and back home. We will have to sit and wait for her at the school instead of driving all the way back home and then go out again to fetch her back. Had I known from the start that classes will be held in Puchong at least once or twice a month, I would definitely not have signed DQ up for the class. Hell no. I have no such leisure time on Saturdays to drive an hour to and fro Puchong when I have other places to chauffeur Alycia and Cass to. About 2 months ago, the coach started to cut short the training time from 1.5 hours to 1 hour. When I Whatsapp-ed him to ask why and whether there would be a fee reduction, he said NO. He freaking said NO and the reason was since this school has very few students, he will soon stop teaching there and only concentrate in the class in the Puchong school. What?! So is this why he deliberately cut short the time so that the students will quit? Why didn’t he tell me that earlier? I was so pissed that I gave him a piece of my mind and I decided instantly that I will pull DQ out of his class. A week later, when DQ told her school teacher that she is quitting taekwondo, the teacher called the coach and asked him if it’s true that he will soon stop teaching taekwondo in the school. I was shocked when DQ told me that the coach told the teacher that DQ and I got the wrong information from him~ he was still going to teach taekwondo in the school. What a liar he is!! I told DQ to show her teacher my Whatsapp messages with the coach. What kind of coach is this with no integrity? This is totally unacceptable to me and I wouldn’t want such a coach to be training my child. I spent the past few days during the school holidays looking for another taekwondo coach for DQ. I called about 3 coaches and finally found one at a gym at our neighborhood. The gym wasn’t my first choice as the fee is the most expensive at RM150 a month (vs. RM30 and RM80 at other schools). 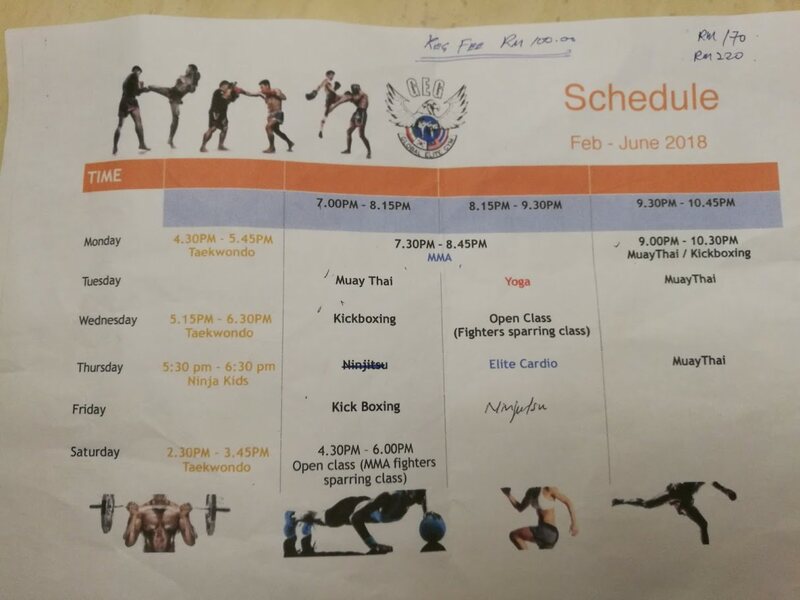 But this gym is the only place that offers taekwondo lesson at a day and time that fit into DQ’s busy schedule. PLUS at RM150, I can choose two other types of martial arts for her. Bonus! My DQ is so happy when I told her that she could learn two other types of martial arts besides taekwondo. I made all the payment and registration fee to the gym on Saturday for DQ. So starting from tomorrow, DQ will be learning Muay Thai and kickboxing (if she has the time for kickboxing) on top of taekwondo! When the big girl found out that her sister will be learning three types of martial arts, she wanted to learn martial arts too! But Alycia will only start the classes after her PT3 and UEC exams in November. Alycia will be learning Muay Thai, kickboxing and Ninjitsu. So don’t mess with these two girls. They will soon be Muay Thai, kickboxing, Ninjitsu and taekwondo fighters! 🥋 🏆 🥇 I think spending some $$ on these two girls for them to learn self defense is way better than seeing them having their eyes and hands glued to their devices. I think it is a good survival skill to acquire too. I think it is so important for kids to learn some sort of self defence as the classes also bring in discipline and focus. My son took karate as a kid and to this day, still keeps in touch with the instructor. The emphasis is defence, never offence. And I like that they also teach street smarts, which sad to say is a vital piece of information kids have to know these days. Most important the kids get a physical workout which in turn gets them tired at bedtime…. Hi Chris, it’s good that your son still keeps in touch with his instructor! He must have been a very good instructor. I believe that every new skill learnt will benefit us. Hopefully my girls will get a good instructor who goes the extra mile to teach them discipline and being street smart other than martial arts techniques.